When Katie told me that she wanted some clothes like we gave Gabrielle it reminded me that I had a peasant skirt for her cut out from the same Heather Ross fabric. I told my mother-in-law, who was here visiting, that I had stalled on it because I loathe gathering. So she gave me a hint and guess what, it was no problem at all. After conquering that issue the skirt came together very quickly. Then yesterday while the kids were occupied I made a matching skirt and t-shirt for Katie’s recently acquired My Friend Jenny doll. I actually won a couple of lots of clothing patterns for this doll — one of the greatest things about the My Friend dolls — on ebay and should have them soon but I was just winging it when it came to this doll outfit. Katrina’s face when I showed her Jenny wearing the new outfit was priceless. So a puppy tea party was immediately planned and even though Onyx is far from a puppy, she got to attend too. Pip, pip, cheerio! EDITED TO ADD: Okay, so what my mother-in-law told me was this… sew two lines of basting stitches and then on one line pull the top thread to gather and on the other line pull the bottom (bobbin) thread. Sorry I didn’t share at first but after she told me that it seemed so obvious I figured you all knew anyway! that might be the best picture I’ve seen this summer. I feel like I could pull my chair up and have some tea with them. Don’t you just love the facial expressions of a child who got exactly what they didn’t even know they wanted? sweet! I LOVE the orange ball-fringe trim! i’m with alicia. c’mon, dish. Oh what a perfect summer photo! I hate gathering too, so I’m with the others. Share the hint. Please? Such a gorgeous skirt! I love the tiers and ric rac! Anything with ric rac! What a sweet little tea party! I actually just learned that gathering technique yesterday. It makes gathering so much easier. How Cute! 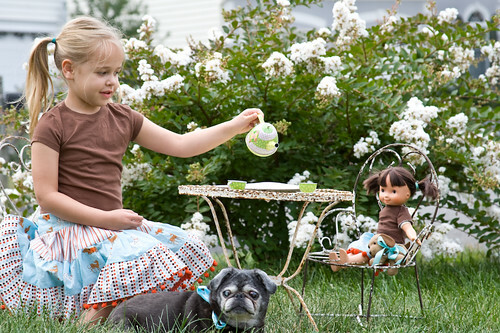 Everyone loves a tea party and those skirts are adorable! For gathering, I like to zig-zag over dental floss or heavyduty thread, saves me from having to do 2 rows of stitches. Great skirt, the ball trim makes it. My interest is renewed thanks to the handy sewing tip and that cute skirt! The skirt is adorable…and My Friend Jenny certainly brings back memories! My mom used to make the most fabulous clothing for my own Jenny. I have the doll set aside, waiting until my little girl is ready for it, but I wonder what happened to all the clothing? And the patterns?! I’ll have to check with grandma! thanks for the gathering tip. I love the look of ruffles, but have a hard time gathering, too. The skirt paired with the brown t-shirt is wonderful! I had My Friend Mandy – and still do – and for Christmas last year I bought a My Friend Jenny for my daughter. She was only 2 1/2 at the time, though, and really had no interest in dolls. Now at three, she still isn’t interested. I’m just biding my time, though…one of these days, we will have a My Friend tea party! Those were the greatest dolls. Wonderful photo, thanks for sharing!